Far, far too often Cyclo�s race nutrition plan looks like this: eat something sweet, eat something else sweet, feel sick, fail to eat anything else. Not good. Salvation from this reoccurring recipe for disaster could, in part, come in the shape of the MuleBar Eastern Express, a new savoury energy bar that bucks the sugary trend. 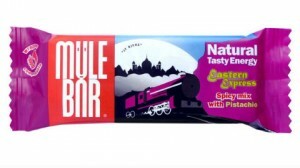 MuleBar have always delighted in doing things a little differently; their rage of flavours � including Pi�acolada, Mango Tango and Strudel � are always a delight on the ride and it�s perhaps no surprise that they have produced something as left field as the Eastern Express given that tentative steps had already been taken with the halfway-house sweet/savoury Liquorice Allsports bar. The Eastern Express combines pistachios, almonds, cashews & pumpkin seeds with an exotic blend of nigella seeds, cayenne pepper and garam masala (itself a heady mix of coriander, cumin, ginger, cassia, black pepper and cloves.) The result is a little like a Bombay Mix with dominant pistachio and a welcome saltiness; on paper there�s a danger that description doesn�t sound great, but trust us it tastes it. Whilst the savouriness and salt hits the spots and proves a welcome break from the same-old sugary sweetness of most bars, the texture too is a surprise; so often on the ride, and regardless of the mix of bars you might try, texture becomes repetitive but the Eastern Express helps mix things up on this front too. 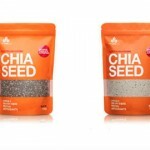 As you might expect from a bar with such a high percentage of nuts and seeds (about 20% by weight) there�s a significant delivery of protein � 7.1g per 56g bar � making them good for recovery too. By way of contrast, taking the Mango Tango flavour as being fairly representative, that would serve up just 4g per 56g bar. 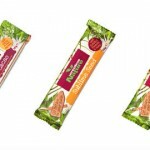 But Eastern Express doesn�t skimp on the energy levels with an impressive 265Kcal per bar, actually higher than the Mango�s 201Kcal, and 22.5g of carbs (15.2g of which are sugars). All this makes the Eastern Express a credible mix not just a novelty flavour. 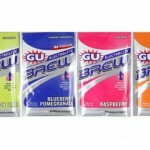 Of course the bars do benefit from a swig of water to help digest, yet, despite the savouriness, no more so than your average sweet energy bar we found.